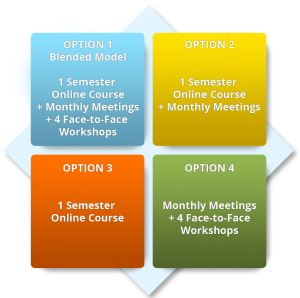 A semester-long online course that utilizes the MPRES Toolkit and other online learning resources. After completing MPRES Professional Development Option 3, participants will be engaged in the Next Generation Science Standards (NGSS) and the National Research Council’s (NRC) Framework for K-12 Science Education. MPRES also offers other Professional Development Options, or contact an MPRES Trainer to arrange a 1- or 2-day introductory workshop before diving deeper into MPRES Professional Development.